I found this one of the most satisfying of the year's early-early music offerings. It balances the rumbustious (not too many of those) with viol consort pieces and features the pure, vibrato-less soprano of Jennie Cassidy in many affecting songs. There are things for everyone to learn from the scholarly and compendious notes by Philip Thorby. The multi-skills of the instrumentalists is a source of wonder and, again, the virtuosity is of a sort that does not seek to dazzle; cornetts and shawms are harder than they sound here. 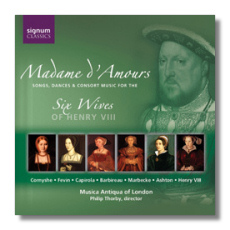 I was tempted to compare the culture and musicianship of Henry VIII's court coexisting with his brutality - he was an accomplished instrumentalist, dancer and no mean composer - with those horrific, sentimental music-lovers who indulged themselves in the Nazi camps. One of Henry's unhappy wives, Catherine Howard, lost her head because of immorality with the court virginalist before her marriage to the King! Signum is generally, as here, compendious in information provided and its booklets are a pleasure to handle. Texts and translations, of course, with details of every instrument and exactly who plays what on each track. The generous timing leaves you little spare from 1¼ hours! A winner.